An eccentric, controversial figure in English literature, Edith Sitwell was best known for avant-garde verse emphasizing the sound and rhythm of poetry. With her brothers she created a literary circle whose satirical, experimental poetry signaled the demise of Victorianism and the onset of modernism. Despite the fact that early contemporaries condemned Sitwell’s poetry as pretentious, inaccessible, and devoid of substance, she later received critical accolades when she moved away from strict experimentalism toward verse that explored universal human experiences through religious, mythical, and natural imagery. While Sitwell’s position in English letters remains controversial, her poetry is increasingly valued for its spontaneous vitality and moral vision. A Pampered Upbringing. Edith Sitwell was born in Scarborough, England, on September 7, 1887, into a family of landed gentry. She was the daughter of Sir George and Lady Ida Sitwell, an unhappily married couple who disliked their daughter’s awkward physical appearance and willful manner. Educated by governesses, she resented the fact that she was not given what she considered a proper education. She was close to her younger brothers, Osbert and Sacheverell. Making Connections. Sitwell experienced her first major transition in 1914 when, at the age of twenty- seven, she moved to London to share a flat with Helen Rootham, her former governess, and gained prominence as the sharp-witted editor of Wheels, an annual anthology of verse she and her brothers founded. She published her first book of poems, The Mother, and Other Poems in 1915. Two years after she published her first book of poems, Sitwell gave her first reading in December 1917. Sitwell’s interest in spoken poetry reached its full expression in the sequence of poems titled Facade (1922). During the 1920s, the period of her greatest creative activity, Sitwell lived in a flat with Rootham in Bayswater, London. She and her brothers participated in the literary life of the capital. Their friends included T. S. Eliot and Aldous Huxley, although there was a break with Huxley in 1922, following the publication of a story by him that included a very unkind portrait of Osbert. Sitwell was an admirer of Eliot’s work, but she was also concerned by the fact that his poem The Waste Land (1922) got far better reviews and far more critical attention than her books. Although an acquaintance ofVirginia Woolf’s, she was never more than on the fringes of the Bloomsbury Group (English intellectuals who met for discussion in the Bloomsbury area of London from the early 1900s until the 1930s). Sitwell thought the group too close knit for her rather independent tastes; even so, there were affinities between the Sitwells and Woolf’s associates, including their strong opposition to war. Sitwell lived mostly in Paris with Helen Rootham from 1932 until Rootham’s death in 1938. In Paris she met, through Gertrude Stein, the great love of her life, the surrealist painter Pavel Tchelitchew. Since Tchelitchew was homosexual, the love remained unfulfilled, and Sitwell often felt betrayed by him. Nonetheless, she remained a constant friend and supporter over many years as she attempted to find buyers for Tchelitchew’s paintings. In 1948 Edith and Osbert Sitwell undertook a lecture tour of the United States that lasted almost six months. It was highly successful and contributed greatly to her reputation in America. She made a new recording of Fagade, and she was the guest of honor at a party given by the Gotham Book Mart, attended by Marianne Moore, Randall Jarrell, Elizabeth Bishop, Gore Vidal, Tennessee Williams, and W. H. Auden, among other notable writers. The success of this tour led to a second one in 1950, which included a visit to Hollywood, where she read from Macbeth. Her interest in Shakespeare had grown considerably during the late 1940s, and several of the plays, particularly King Lear, had a marked influence on her work. Her interest in the Elizabethan period included a fascination with Elizabeth I, which gave rise to her book Fanfare for Elizabeth (1946) and the ill-fated plans for a Hollywood film based on it, to be directed by George Cukor. Kudos and Catholicism. Largely unrecognized or scorned during her earlier years, Sitwell was lavished with honors in her last years. In 1951 she received an honorary doctorate in letters from Oxford. Three years later, she was made a Dame Commander of the Order of the British Empire by the queen. Her seventieth birthday was celebrated by a luncheon given by the Sunday Times, her seventy-fifth by a concert at the Royal Festival Hall, which included a performance of Fagade. From the time she discovered the poetry of Wilfred Owen as an editor at Wheel, Sitwell was an avid supporter of young artists. In the 1950s, Robert Lowell, Allen Ginsberg, and James Purdy were among her favorites. In the meantime, Sitwell’s religious beliefs had intensified, and she converted to Roman Catholicism in 1955. The church provided consolation for her during her last years of ill health, and Sitwell received the last rites of the church before her death in London on December 11, 1964. Marianne Moore (1887-1972): Besides winning such awards as the Pulitzer Prize and the National Book Award, this American modernist poet contributed to the naming of Ford's Edsel automobile. James Hubert ''Eubie'' Blake (1887-1983): A popular American composer, lyricist, and pianist of jazz and ragtime music, Blake created one of the first musicals written and directed by an African American. Elizabeth II (1926-): Queen Elizabeth II has reigned over the United Kingdom, as well as sixteen commonwealth countries, for over fifty years. Ezra Pound (1885-1972): Pound, an expatriate American poet, was a major figure of the modernist movement in poetry. James Jones (1921-1977): Author of the popular From Here to Eternity (1951), Jones based his books on his World War II army service. In the introduction to The Canticle of the Rose (1949), Sitwell wrote: ‘‘At the time I began to write, a change in the direction, imagery and rhythms in poetry had become necessary, owing to the rhythmical flaccidity, the verbal deadness, the dead and expected patterns, of some of the poetry immediately preceding us.’’ Her early work was often experimental in creating melody and used striking conceits, new rhythms, and confusing private allusions. As her technique evolved, she came to use sound patterns as an element in the construction of philosophic poems that reflect on her period in time and on the human condition. Antiwar Poems. While her anti-World War II poems—such as ‘‘Still Falls the Rain,’’ based on the air raids on England at the beginning of the war, and ‘‘Three Poems of the Atomic Age,’’ based on the bombing of Hiroshima—would make her a legend of the literary period, they were initially dismissed because of her unorthodox manner of presenting them. These early poems intermingle startling images of demonic, mechanical, and natural worlds to present an elaborately distorted picture of a world gone mad. They also reflect the richness of color and sensuality that had stirred her as a child and influenced her poetry throughout her life. Finally, these poems exhibit an extraordinary sense of rhythm which, with other experiments in sound, proved to be Sitwell’s most marked and controversial gift to contemporary poetry. Singing Poetry. Public readings became important for establishing Sitwell’s reputation, and much of her early poetry owes its character to the presumption that it would be read aloud. It was Sitwell more than anyone else who realized the importance of sound and texture in modern poetry, and she introduced a poetry designed to take full advantage of the flexible rhythms of the spoken voice. She did not invent the idea of reciting poetry set to music, but her performances of Fagade gave it its most distinguished form. Sitwell’s interest in modern art was considerable, and Fagade should be considered an integral part of the international movement that embraced poetry, painting, and dance. Half of the poems that eventually found a place in Fagade were composed earlier, while the others were written specifically for music by William Walton. Influences on Art. Sitwell’s manner of dress—flowing gowns, turbans, amulets, and silver nail polish—generated as much attention as her unconventional poetry, and she became a sought-after subject of painters and photographers. Her influence among artists has continued into the twenty-first century. For example, she has appeared in literary and musical compositions by Kingsley Amis, Saul Bellow, and Andrew Lloyd Webber. The Grateful Dead’s Robert Hunter drew from Sitwell’s ‘‘Polka’’ when writing the song ‘‘China Cat Sunflower’’ and the punk-pop-rock British band Shakespeare’s Sister borrowed from Sitwell’s ‘‘Hornpipe’’ for their song ‘‘I Don’t Care.’’ Clearly, Sitwell’s lasting influence has justified her career, that of a poet who had as many early detractors as she now has devotees. I Love Artists (2006), poems by Mei-mei Berssenbrugge. Berssenbrugge's poetry incorporates the New York school of poetry, phenomenology, visual arts, sensual science, and more. The Dancers Inherit the Party and Glasgow Beasts (1997), poems by Ian Hamilton Finlay. Finlay's poetry is tactile and joins type, line, and sculpture for an experience of the senses. The Book of Disquiet (2002), poems by Fernando Pessoa. Metaphysical poetry is conveyed through the writer's many heteronyms, or words that appear the same in written form but sound different when pronounced aloud and have different meanings. Tender Buttons (1914), an experimental text by Gertrude Stein. Stein's experiments with language manipulation made her a pioneer in style and method. Gold Coast Customs. Sitwell’s body of work contains rare political poetry in an equally rare format and style for the period in which she wrote. One such example is Gold Coast Customs, the culmination of Sitwell’s development toward a position as a poet of social commentary. Marxist critic Jack Lindsay noted that Gold Coast Customs represented ‘‘the deepest—almost the only—political poetry’’ of the age in England. Technically, for many critics, Gold Coast Customs is a major accomplishment. It interweaves the funeral customs of the African Ashantee nation with contemporary society life of London—Sitwell’s contemporary figure, Lady Bamburgher, is a symbol of the moral and social corruption that lies beneath the surface of fashionable life. It illustrates an almost complete abandonment of a straightforward narrative; instead, it is structured around a series of contrasts. The poem’s strong beat and clear voice give a striking portrayal of historical patterns of decay and betrayal. In keeping with other works of Sitwell’s that are accompanied by religious imagery of rebirth at a time when religious faith in poetry had become unpopular, Gold Coast Customs concludes with a vision of transformation and salvation. Criticism through the Years. Sitwell’s career has undergone a great deal of reevaluation through the years. In light of her eccentric personality and literary friendships, several critics continue to agree with F. R. Leavis’s early estimation that Sitwell belongs ‘‘to the history of publicity rather than poetry.’’ However, others regard her as a formidable figure whose career traces the development of English poetry from the immediate post-World War I period of brightness and jazzy rhythms through the political involvements of the 1930s and the return to spiritual values after World War II. Dilys Powell asserted, ‘‘The fact remains that she was one of the writers who bridged the gap between the sterile years of the early war and the post-war years of excited experiment; that she helped keep interest in poetry alive when it was near extinction.’’ She should be remembered as the angry chronicler of social injustice, and as a poet who has found forms adequate to the atomic age and its horrors. 1. Imagine you are in charge of setting the stage for a Sitwell poetry performance. What props would you include to enhance the meaning of her work? Create a visual representation of what the stage would look like. You may draw, paint, make a collage, use computer programs, photograph people or objects, etc. 2. Research writers in the twentieth century who converted to Catholicism as adults. What can you infer both from their writing and from events of the 1900s that might have led to their conversion? 3. Read some of Osbert Sitwell’s poetry. How does his work compare/contrast with that of his sister? Brophy, James. Edith Sitwell: The Symbolist Order. Carbondale: Southern Illinois University Press, 1968. Glendinning, Victoria. 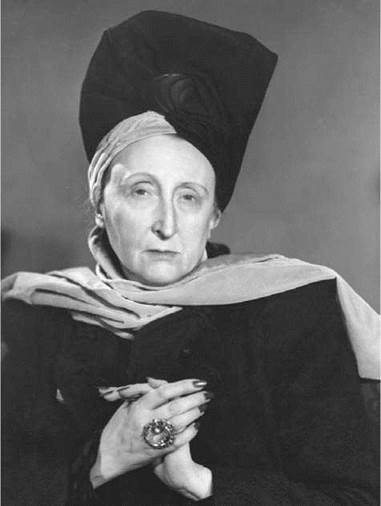 Edith Sitwell: A Unicorn among Lions. London: Weidenfeld & Nicolson, 1981. Villa, Jose Garcia, ed. A Celebration for Edith Sitwell. New York: New Directions, 1948; Freeport, New York: Books for Libraries Press, 1972. Edith Sitwell: A Nearly Forgotten Poetess. Retrieved February 14, 2008, from http://165.29.91.7/classes/humanities/britlit/97-98/sitwell/Sitwell.htm. The Lied and Art Song Text Page (Emily Ezust, ed.). Author: Edith Sitwell (1887-1964), Texts Set to Music. Retrieved February 14, 2008, from http://www.recmusic.org/lieder/s/sitwell.